An authoritative report, prepared by Wheebox, India’s leading online talent assessment company, in alliance with Confederation of Indian Industries (CII), United Nations Development Programme (UNDP) and Government of India’s All-India Council of Technical Education, has found that Gujarat fares poorly in job-readiness talent, necessary for passed-out students to work in industry. Based on a sample size of 560,000 final year students -- engineering gaduates, BSc, MSc, B Pharma BA, B Com and Polytechnic passouts – from 29 states and seven union territories, the “India Skills Report 2017” has found that, “developed” Gujarat ranks 10th in employability of the workforce seeking jobs, with Maharashtra at the very top, followed by Andhra Pradesh, West Bengal, Uttar Pradesh, Tamil Nadu, Rajasthan, Karnataka, Telangana and Haryana. With a cutoff of 60% and above marks, the cities found to be “most employable” are New Delhi, Pune, Udaipur, Sholapur, Nashik, Bengaluru, Jaipur, Aurangabad, Lucknow and Warangal. An agewise analysis of employability by the report suggests that Gujarat ranks 9th among 10 states in the age group 18-21, with West Bengal topping the list, followed by Maharashtra, Rajasthan, Karnataka, Uttar Pradesh, Andhra Pradesh, Haryana, and Telangana. 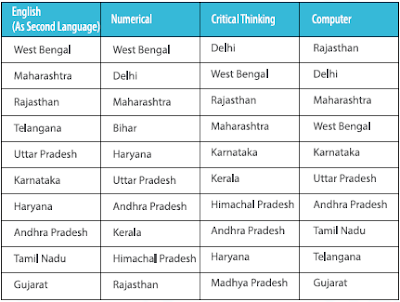 However, in the age-groups 22-25 and 26-29, Gujarat does not figure among the top 10 states. Interestingly, coming to the salary expected, one of the “employability” criteria, Gujarat figures fifth among the lowest category, of up to Rs 2 lakh per annum, with Tamil Nadu, Uttar Pradesh and Maharashtra and Andhra Pradesh ranking better. As for the other two categories – Rs 2-2.6 lakh and more than Rs 2.6 lakh – Gujarat does not figure among the top five states, suggesting it has poor talent pool for hiring. In the Rs 2-2.6 range, the top five states are Tamil Nadu, Maharashtra, Uttar Pradesh, Andhra Pradesh and Karnataka, and in the range more than Rs 2.6 lakh are Maharashtra, Tamil Nadu, Uttar Pradesh, Andhra Pradesh and Rajasthan. The report states, the candidates were asked to share their preferred work areas. 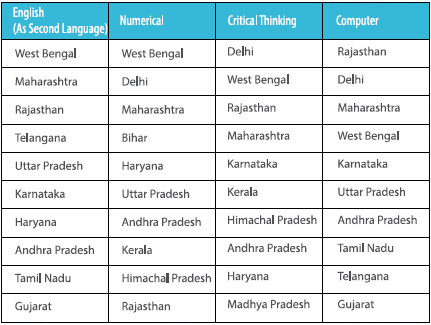 Here, while Bangaluru tops the list, none of Gujarat cities are found part of the list. The cities included in the list are Pune, Chennai, Mumbai, Hyderabad, Delhi, Coimbatore, Delhi (NCR) and Lucknow. The report states, among cities, the highest percentage of employable workforce is found in New Delhi 67%, followed by Udaipur 62%, Dhule 61%, Hyebabad 53%, Pune 60%, Bengaluru 45%, and Lucknow 39%. Here again Gujarat’s cities are not in the list. 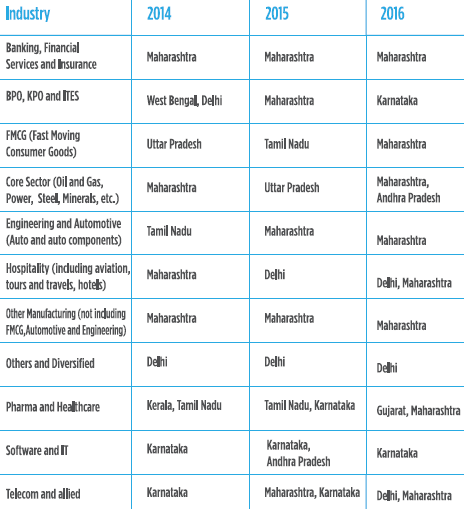 Among the preferred states for hiring, Maharashtra tops, followed by Delhi, Karnataka, Tamil Nadu, Andhra Pradesh, Haryana, Gujarat, Telangana, West Bengal and Uttar Pradesh. However, ironically, a sector-wise breakup suggests that Gujarat is a preferred state only for one sector, pharma and healthcare. As for the rest, ranging from banking and finance, BPO and ITES, fast moving consumer goods, core sectors (oil, gas, power, mining and steel) other manufacturing (consumer goods, automative and engineering), hospitality, software and IT, and telecom and allied sector, Gujarat is part of the list. In spite of all this information Gujaratis prefer to move to Gujarat.